Hot on the heels of the new Mini Countryman making its debut comes news that the impressive Mini Paceman has also been revamped. Mini claims this is the world’s first ‘Sports Activity Coupe’ for the premium compact segment and most of the fresh changes happen underneath the bonnet which feature new, more efficient engines with lower CO2 emissions. Indeed, the new diesel and petrol Mini Paceman models now comply with EU6 emissions standards while the Paceman S has slightly more power and will develop 190 bhp. Despite this increase, CO2 emissions have fallen from 143g/km to 139g/km with emissions also falling for every model in the range. The lowest emissions are for the Mini Paceman Cooper D at 111g/km. Joining the new line-up is the Mini John Cooper Works Paceman which comes with an engine output of 218bhp and has the firm’s ALL4 all-wheel drive system fitted as standard. Designers have also helped to increase efficiency by tweaking the underside of the vehicle to improve airflow and have added new low rolling resistance tyres to every model. The exterior changes are restricted to the rear lamp cluster and a more aggressively-designed sloping roof line, which comes in a contrasting colour. There are also two new colours for buyers to choose from and light alloy wheels have also been added. When it comes to the interior, the designers have created a sportier cabin and opted to use new anthracite-coloured dials. As potential buyers would expect from the Mini Paceman, there’s an excellent range of standard kit which includes Bluetooth connectivity, air con, LED fog/daytime lights and rear parking sensors. Mini was the first big manufacturer to offer buyers huge array of options for their vehicle and that still remains true for the Mini Paceman which include choices for the upholstery, interior colours and trims, an electric sunroof, a removable tow bar and the Mini navigation system. There’s also cruise control, a multifunction steering wheel and a specific accessories list for the John Cooper Works models. 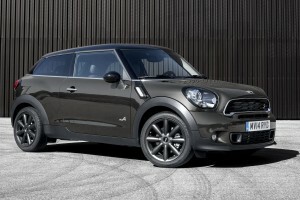 Essentially, the Mini Paceman also has an improved driving performance and its aerodynamic have also been improved. This is a stylish car with a 2+2 seating formation – there are two excellent seats for the passenger and driver along with two separate seats in the rear for passengers. Mini also say that its new Paceman is much quieter than the outgoing model with vastly improved acoustic insulation and the new suspension technology will help improve the car’s agility and help give it an unmistakable go-kart feeling when driven. This entry was posted in Car Leasing, Cars, Family Car, New Cars and tagged lease a new Mini Paceman, mini, mini countryman, mini paceman by Steve Lumley. Bookmark the permalink.